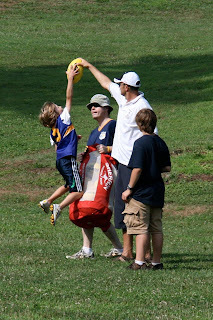 Junior Australian football in the Washington DC Area. 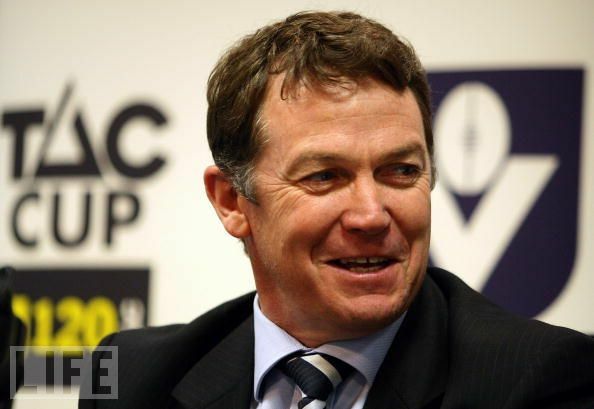 We have moved to www.SatMorningFooty.com. While you are there register for summer program beginning June 18 at Bluemont Park in Arlington VA.
AFL Coaching Director, 3 time Hawthorn Premiership player and former Hawthorn Head Coach, Peter Schwab will be helping out Saturday Morning Footy in December. Friday December 3, 7p Coaching Clinic is CANCELLED. 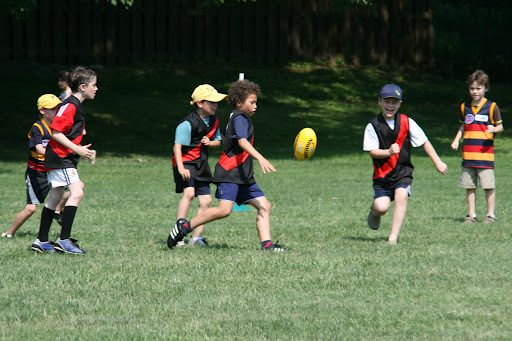 On Saturday December 4, Peter will help with Saturday Morning Footy's Winter Camp. The winter camp clinic and game will run from 9am to 10.30am in Arlington VA. The camp is free. To register CLICK HERE. Another successful season of Saturday Morning Footy! Thanks to all the players, parents, Eagles players and coaches that helped make this the best youth sports program it can be. Practicing "Speckies" at the Saturday Morning Footy program in June. For this drill, it is useful to have a former professional basketballer holding the ball up! (Kurt played for the Tasmanian Devils in Australia's National Basketball League). In the drill, players run up and leap on to the bag then look up to put grab the ball. As they get better you can change things and toss the ball in the air, so players can practice their leap and timing. They also get a lot of practice falling! Speckie practice is by far and away the most favored drill for the older players. A hugely successful 2010 season of Saturday Morning Footy wraps up on Saturday July 24 at 9am at Bluemont Park. As always, it is never too late to register. If you have yet to register, please do so at the field on Saturday. After the rain out on July 10, we are back July 17. Arlington has closed all natural turf fields until at least 12pm for Saturday July 10. So Bluemont Park is closed and we are CANCELLED for the week. We will be back at 9am on July 17. You can also watch the replay of Hawthorn v Geelong game on ESPN3.com. 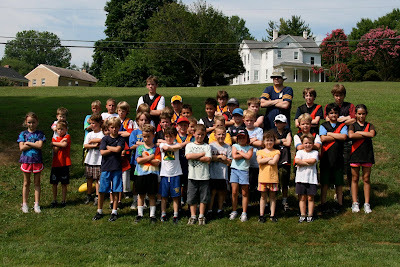 To register for the Saturday Morning Footy's FREE winter clinic on Saturday December 4 2010 CLICK HERE. Collingwood's #50, Shae McNamara, is hoping to be the first American to play AFL. If you have a question for Shae, CLICK HERE and fill out the form.